Today we are happy to announce the launch of our brand new look. We’re excited about the newly designed Webs.com so you can enjoy simpler organization, easier navigation, and quick access to your site building tools. No worries, you don’t need to do anything. Your existing login will continue to work. You may notice some elements have moved to a different part of the page to give emphasis to the ones that are most important. A new Control Panel was created that consolidates site-building resources on one page so you can easily and quickly access what you need. A drop-down menu in the top left corner gives you an easy way to switch between your sites, as well as quick links to creating a new site, getting back to your dashboard, accessing support, and logging out. We have added a “View Control Panel” blue box for each of your sites. The Control Panel houses all the site—building resources you’ll need. 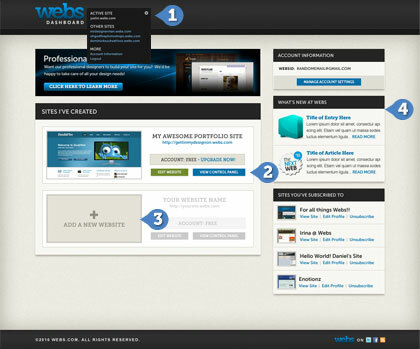 The “+ ADD A NEW WEBSITE” box below your listed sites provides the quickest way to start a new site. Some elements that used to be on the left side of the page – your account info and updates from our blog – are now on the right side. As before, you can easily drag the pages of your site up and down to re-order them. 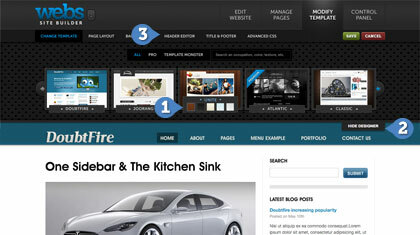 Manage Website: tools for altering the look and feel of your site. Edit Website is where you edit your site, exactly like you used to. Modify Template offers a great new way to check out template options and colors. Control Panel is our new section: it’s a hub for all your site-management resources, from Website Statistics to Email Campaigns. More easily view template options and by clicking on a color variation, you immediately see a large preview. Hide the template designer if you like to view the site in full screen, with the button in the middle of the screen. Have more editing options in a combined header and footer tab. 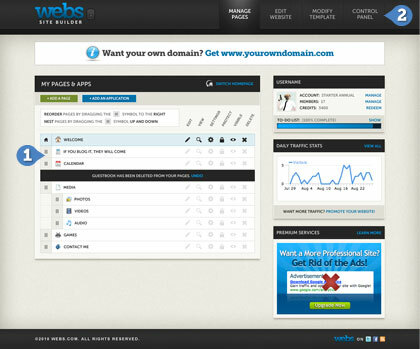 Manage Website: all the tools you need to alter the look and feel of your site. Marketing/Site Promotion: all the tools you need to drive more traffic to your site. Revenue: ingenious, easy ways to make money with your website, such as with a Web Store. Premium Services: all the VIP benefits you get as a Premium user. @Alice: You can see the blog link on your Dashboard (on the right hand side). You can also access the blog directly by going to http://blog.webs.com. I will be honest here, me adn all my admins are having a hard time acessing your new updates. They are very glitchy, and we are hoping you change it soon! These updates have ruined a lot of things now, and we can’t even change our font color or text. I absolutely LOVE the new makeover. It took me a minute to find out how to edit the sidebar, but I found that you just put your mouse over the sidebar and click. Great Looking Website- I’m loving it! Indeed, I noticed the new look; but sorry, I prefer the old one that’s simple and more user-friendly. Don’t like the reverse design white text on black. Can’t find my way now. For our site alone, is it possible to have the old look please? I am sure I will find some advantages like have been detailed here, but so far the old way looked better, was color-coded in a way that made it easier to navigate, and it’s missing the view to site button after making changes in it’s usual spot. It always had view site in the pages menu. It seem to go slower and get more confused with multiple clicks through various administrative menus. I am sure this conserves hosting bandwidth, so I hope it finally starts working faster. I guess it will take some getting used to. The other to me did look better, but maybe others will disagree. I wish that some warning was given, because it took my a while to find this note. The sign-in was even more attractive before. I wonder if Webs partly is just copying another hosting service, but apparently there are improvements. Everything just looked so polished before, and now it looks rudimentary. I don’t get it. Thanks in advance if it does turn out to be better. Or have you deleted them like people were saying you would? All that black makes it look very serious and grim. Wow, Webs.com now looks better than ever before…Nice job. How do I manage my sidebars now? @Delightsworld: We have simplified the process. Now, to manager your sidebars all you have to do is just click on your sidebar area while editing your page. Do not like the new changes. Where is the box that allows you to change font, color, spacing of sentences, etc…..? @Mike & @Janet: You might need to clear your browser cache to see the toolbar. If someone can help me w/finding the CONTENT BOX, FONTS, FONT SIZE, JUSTIFICATION, COLORS, etc., tool bar w/the new “look” I’d appreciate. Each page comes up OVER the toolbar and I am unable to use those edit functions. Not real excited over your make-over. As is the case with so many make-overs, the “new and improved” is much more complicated to navigate and provides TOO MUCH info. The look is good — the function is overkill. Thanks! Colors blue on black are too hard to see on some screens. While it looks OK on my 22″ when working on my 15.6″ laptop — not so good. Trying to find items hidden behind hyperlinks – like My Messages – is difficult. Yes, later when we have had experience and “know” where to look it will be easier. Now, especially if you are rushed, it is very difficult. Loading SiteBuilder sure seems to be slow today. Maybe you have a lot more traffic as people are looking at the new design??? While your redesign is appreciated, it sure would be nice to increase the speed. For example, increasing Publish times would be helpful. For some reason I can’t access the Webs website or any other .webs website. Help please, because I really want to continue working on my website. @GIMPTutor: Have you tried clearing out your browser cache? Outstanding changes. but under the hood application also need to be changed and streamlined ,like member page , control panel. etc. When I try to edit all the correct features are on the home page. But that is the only page it is allowing me to edit. How do I edit the other pages please??????? I can` t edit the (colume)right side of my site , what is going on , I need to update my site, this is causing me a big headache . why why why I FEEL THIS UPDATE IS A BACKWARD LEAP , NOT GOOD !! can someone help pls…! @Jamie: To edit your sidebars, just click on the sidebar area when editing your page and it will take you directly to the sidebar manager. Congradulations webs. I am verry Pleased with the new layout and look. It’s strange…I can’t sign in or go to any other Webs.com websites…Is this a glitch that happened during site change? Oh my Goodness! I got on Webs this afternoon, and I was like -“Wow! Webs has changed, and it’s so cool!” I love the new look! Well….the new lay out is very hard to understand. I was just getting to know the old one then it changed. I wish the old lay out was back because it was alot better with uploading and finding things. There should be button that gives user the choice to change between this lay out and the old one. The new update seems to be really slow. I checked my signal and it is excellent. I am learning the new version and really can’t make an adequate decision right now, as with anything new, it takes time to navigate through, just like it was when I first began with the old. Are you going to have any new themes. @Linda: Yes we do plan to bring new templates to our users in the near future. This is a nice look. But, it’s not like you guys added any new templates. You just made some more backgrounds, here and there. It only seems that you just organized it and changed the look, and everything is still the same. I CAN’T EDIT MY SITE!!!!!!!!!!!!!!!!!!!!!!!!!!!!!!!!! REPLY : To webs , I have tried this, and still not working !! You’re killing me with this new design. The tops of my web pages cover the bar at the top so that I now cannot add anything to my sites because my web page covers everything but the tip of “Page Options.” If I can’t update my sites with new content boxes or pictures, I’m going to have to close these sites and search for a new web hosting service. @Anthony: Please clear out your browser cache. the change is really nice looking,,,,,,but every positive has a negative (or vise versa). Basically, its to large for my large screen so I have to minimize everything, and it won’t let my do variuos tasks, but, lots of the new options for backgrounds and templates are super nice, and WAY better! I’m LOVING the look of my site, despite how difficult it was to make it. I think the site theme shoud be decorate with light colours. I respect your webs work but i’m the member of webs and it’s my resposibility that i should point out the wrong thing those aren’t in the favour of webs community. Just I’ll say color shoud be light. please I wanna ask about how can I access to my messages and the filled forms applications. previously before making this updates, there was something called “community” tab and then “messages” tab where I can see all my messages and inbox and forms. please someone tell me how can I reach there after this changes? the look is too square and the colours are single- no shadow or soft edge. would like a softer feel to it. Where is the Addons ? i want to look at my poll results on my site but cant find the addons button ? @Dylan: If you have an HTML only site, this option will show up under the “Manage Pages” section. its done … thank you webs team. When i use most web browsers, the tob bar in the site editor, the one with link, html, addons, ect wont show up ? its covered up by my logo ? but the colors are nice…. The refresh is looking good! Any word on some new templates for us “common” designers, too? Or am I going to actually have to learn coding? :(? The new website looks so much more professional. I am astounded by the new UI that Webs has put into place. Great job, Webs! AWSOME! Love the improvements. More options as well. Still figuring it all out. You listened to us! Love the look and feel of the new site! Though the new look is nice and I can navigate everything much easier, I tried to view my page from my PC and the whole page is cut off on every page. I can scroll down to the bottom. In edit I can see everything on my page, but when I type my page in the browser to view it, I only see 1/4 of the page. OK so now i found that you can indeed add a video so good job! BUT HOW TO DO YOU RESIZE THE VIDEO? IT is so small, i want to make it bigger. HOw do i resize it? Okay, so I’ve read through this forum love the new look, might take a bit of getting used too but so does everything! Just ONE question that I couldn’t find an answer too, How do I actually ADD a sidebar? I’ve tried clicking to the side of my page and nothing happens? And I cannot find any button saying “Sidebar” or “Add Sidebar” ect…? But I really need one :/ HELPPP!! Okay… love the new webs.com skin, but where are the new templates that ar listed under “features” on webs.com home page? The are listed as doubtfire, Joorang, Unite, Atlantic, and Classic. Even after I cleared my cache I can only see all the old templates and not these new ones. I would certainly hope that this changes will not causes too much hassle for us in anyway. Although the new design is OK (it takes up more space at the top), you should at least make it compatible with IE 8. Sometimes, I need to either enable or disable compatibility view with IE 8, depending on what task I need to do. I do not like the fact that the Webs editor is suited for Firefox. Oh and by the way, can someone please give me more information on Webs removing the personal Forums?! Unless they mean the super, super old one, I’m not too happy about that. The new layout confused me at first, but I was soon abil to get a hang on it. Finding this blog a little to late, ha ha! 1. There are no new templates. Come on, guys. I’m sitting here staring at these cool templates you have shown in the pictures (‘Atlantic’, ‘DoubtFire’, etc.) and it makes me wonder when we might get something. I realize these templates may be either a) prototypes, b) some of those “professionally designed” templates, or c) templates that you make in your free time, but they look cool. I know my template needs some serious template updates. 2. There are no new applications. I know that you don’t necessarily provide the applications, but ever since the Buzzworthy app was discontinued, I have been dying to get ahold of a good widget/html document for a news feed. Please, at least, get another one of that kind of app back! 3. There aren’t any updates to what you can do with the pre-existing templates. Multiple navigation bars, double-sidebars, columnized footers (like what you have), etc. would be great to have! I’m not completely (if at all, really) savvy in CSS or even very much HTML so I can’t create that kind of a thing for my website myself. Please help us out! Thanks for your time and I hope some of these wants can be answered with an “It’s coming soon!” or an “It will be out ‘x’ day!” I know it’s crazy to ask for that, but I’d really like to see some of these features! I love, love, love this new look. It looks very professional. I was so amazed when I logged on and saw the new look. I am very immpressed….good job. Before the up-date I had my side bar turned off. But I will like to turn it back on, how to I access the side bar menu to turn it on and off? @Crocheters: To enable your sidebars: Go to the “Edit Website” section and hover around sidebars section. You will see “Enable Sidebars” option show up. Just click on it to activate. When I opened the account of my webs and see the change I was really amazed, its a beautiful gift by webs to its members on Christmas and New year. Merry Christmas and Happy New year to all the webs staff and members. Hope you can fix them soon. Hi ALL at Webs.com, what a wonderful surprise when I logged into my website! I’m having a problem copying and pasting a few things out of my blog onto one of my new pages. I was able to do it but not anymore. Why not? Anyone have an idea? Please help. Hi,I’m glad for the new changes and all but I can’t seem to upload any videos to my site at all.Neither can I write any articles to my site.Please can you help me? I dont Like the New Look..And i Found Some “Bugs” The tool Bar is Half hidden! PLEASE put it back to normal……. I would like to say, oh my Gog!!! This is very nice and easy to operate . In addition , I would mind telling you that I am very impressed . Thanks to all of members of the webs team. That was my first thought but nothing shows up. Does it make a difference if I use Google Chrome or Internet Explorer? Webs Team – I have tried everything to enable my sidebar, like you just said, i tried hovering and spent half an hour leaving my mouse in different places. No edit sidebar or enable sidebar button appeared. I really need a sidebar! Please help!! Template looks so sleek, polished and professional. Combined with the other enhanced features may be the tipping point for me to switch over to Webs for simplified elogence for a non techie like me who doesn’t like fussing with HTML code and theme stuff in WordPress. Everyone here who is mad is just plain dumb… Empty ur browser chach and cookies for the 12th time now. Webs this looks great much more exeptable. And still think that you should let us remove ads through the credits shop! Like 200 credits for 6 months of no ads…. And if I get a domain from the credits shop will it remove the ads for the one year that the domain is activated? @Jaiden: Yes getting a domain name through the Credit show will remove ads on your site for 1 year. help , how do i get back to setting up web page?? @Malcolm: To edit your site click on the “Edit Website” located in the top right hand corner. Just would like to let you know that since webs site upgrade i have been unable to edit any content in my webpage. Everything loads up ok apart from the toolbar which enables you to change font and add content. I have tried on a few pc’s and also internet explorer and firefox, but still no luck. Is this a bug you know about or are in the process of rectifying the problem or is it something to do with my pc’s? I agree with Jay, I can’t do much on my site either. I can’t upload any photos (which is very frustrating as I rely on my site for this). The format doesn’t fit my computer screen unless I change the resolution, making the letters so small they are hard to see. There are other things I don’t like either. I have put a lot of work into my site and now don’t know if I will have to move it to a different company. I picked Webs because at the time it was easy to use and I could manage my site at any time. Now that is not true. The new design is beautiful! We so much appreciate the good work that you do. God bless you! Looks great! Sign of a strong company is progress. I built my website through webs 2 yrs.ago, the simplicity and understanding of website building was excellent for our business. This new format will be easier for our business. Thanks. Love the new design. Will we be seeing any new templates soon? Hi, I am having the same problem as Jay. I love this site and I really need the editing problem to be fixed! I can’t add content, links, or anything else. PLEASE HELP ASAP ! The black background is darker and harder to read. The builder looks a little different, but basically laid out the same with no new features on the edit tool bar. It took me an hour to find the tiny little icon that you hover over to get a little window so I could log out. It was right out in the open before. The old look was bright and easy to read. This new look is NOT! When you publish a page, the little window that pops up in the middle of the screen used to have a choice to take you directly back to the main builder page. Now that feature is not in that window, and is an extra step at the top of the page. That is not easier to navigate. When we first log into the builder, it should go directly to the main site builder page where we make a selection of a page to edit. But it goes to the website home page instead. The problem with keeping a link opening in a new window, is still a problem, but now it is worse. I can’t have a link and a separate photo with the same link to open in a new window. One opens a new window, the other does not. If I fix the one that doesn’t, then the other won’t open in new window. If I fix that one, then the other one is bad again. I prefer the old look. It was easier to see and navigate. And I could fix the open in new window problems, but not now. This is not an improvement. You should have left the old program on and fixed the few commands like I suggested and got jumped on for. I’m paying you $100 a year and you just made things worse. Thank U so much for the innovations. This is indeed the gift of the year to us. Nice change but – I use drop down menus. I’d like to be able to deignate a page as just a menu header on the page list so that if a user clicks on the header nothing happens (no url). I and others have been requesting this fo a long time. Right now, I have to put a message on that page telling the user to make another selection which is not elegant at all! I wonder how long will it take to resolve all the problems? I couldn’t edit any of my pages. I hope things will be perfect before 2011. I just wanted to say that I really love the new makeover! It is a lot easier to manage and update my website now! I like reading about all the updates that webs.com makes. 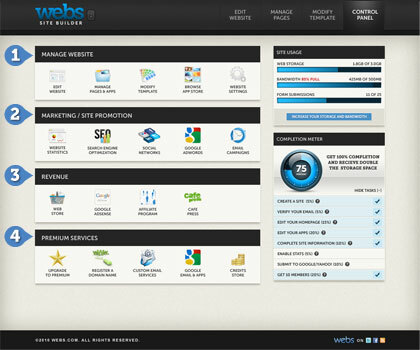 I have been with webs.com for a few years and have never had a problem with the services. Keep up the good work guys. I have 3 sites and I cannot edit them now. There is no way of starting new content on new pages. And I can’t add content or change fonts etc on old pages! Is this a glitch that will be fixed soon? Thank you. June. I like some parts of the new design and know you guys work hard to get it all just right. Just wanted to say I liked it better before when I could see more of my site when editing. Where as now there is a big part of the screen being taken up by the huge top tool bar(?) I can only see a very small portion of my site, which makes it more difficult to edit. Im also having problems editing text boxes and pictures, it wont let me center any text, I can’t even click on the center box anymore. the new look is kinda nice but some of the background categories are gone and replaced and it doesn’t work well and by it i mean the backgrounds. I don’t like the new look!! I can’t add content box in Google Chrome!! Only in Internet Explorer or Safari!!! Please correct this Bug! I cant change the background of my homepage. If i change the background all the pages are changing in the background i want except for the homepage that on keeps on using an Old background. Excellent changes have made a great deal of difference to the way I Control and Run my site ……. @Kiran: Your site has been reset back to the site builder status. I put my site up at the end of December, and I love it. It is easier to use than any other site I have ever tried! I dont’ think I noticed any changes, I must have had the new innovations from the beginning, it is great! This is a Very Good Site & Very Best For New Site Creator. This is very good web . I like it. Enjoying the site building. Thanks a lot. this is the greatest thing that have happened on the internet. the new look makes the website easy and quality usage. thousnd thanks to the administrators. Have you added any way to change the colors of individual event titles on a given day on the calendar? Or be able to highlight them? Something to set each event apart? It’s frustrating for all events/items in a day to all look the same.